Fluency for the Year is a collection of differentiated passages and comprehension questions designed to helps students build fluency and boost confidence in reading. Please view the Preview to see some of what is included. This is the April packet from the Fluency for the Year Bundle. To save BIG, purchase the bundle by clicking here. Included in this packet, you will find 10 April passages (20, if you include the differentiated version); 5 fiction passages and 5 nonfiction passages). 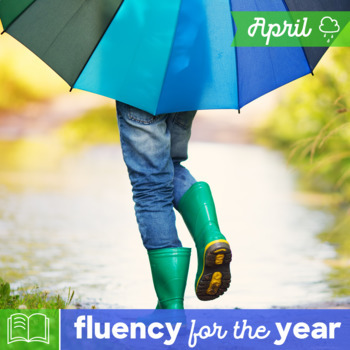 The Fluency for the Year April Packet is a resource designed specifically with first graders and second graders in mind. The passages would work wonderfully with advanced kindergarteners and struggling upper grade students too. You will notice that some of the passages are quite long. Students are not expected to read the entire passage at one time. The goal of these fluency passages is for students to improve with each read. This is an important piece to emphasize to students. Fluency is more than just speed. It’s not about being the fastest. Prior to having students read these passages, I would do a mini-lesson on what fluency is and model what good reading looks like vs. does not look like. Fluent readers are readers who read smoothly, accurately, with expression, and at a good pace and can comprehend the meaning of the text. Encourage students to pause when needed, take in the information they are reading, read smoothly, and with expression. The goal of these passages is for students to increase their fluency growth with each read and to build confident readers! I have seen students grow leaps and bounds using these passages! They are jam-packed with fascinating facts and entertaining stories. I hope you see a lot of fluency growth using these passages. There are multiple options when using these passages. I’ve differentiated the passages so you can better meet students where they are. Option 1: Prepare each student with a Fluency Folder (see next page). Students will read the passage (Student Version) while you track along as they read (Teacher Version). The goal is for students to improve with each read. After the 3rd read, you can have students orally answer the comprehension questions OR you can have them answer the comprehension sheet independently. A rubric is provided for you (this is for the teacher only). This option is ideal if you are needing a simple assessment tool to monitor progress. The teacher and student can develop a fluency goal together and write it on the teacher sheet. Option 2: Prepare each student with a Fluency Folder. Students will keep their passages in their folder and track their own progress using a stopwatch. This means students will read the passage, record their time, and try to improve their time with each read. If students come across a word they do not know, give them 5 seconds or so to try to decipher the word. If they still cannot determine the word, have them mark it as an error. After the 3rd read, you can have students independently complete the comprehension sheet.